These 2011, 2012 and 2013 Perfect Game Bowman Rookie Cards were distributed by Topps in very limited quantities exclusively at the All-American High School Classic Game at Petco Park. All cards are in NrMt-Mt or better condition unless stated otherwise. We cannot guarantee any specific grade from any specific grading company. 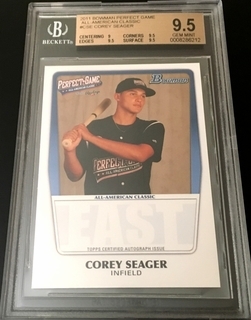 Shown at right is a Corey Seager 2011 Perfect Game Bowman Rookie Card graded BGS 9.5 (GEM MINT).